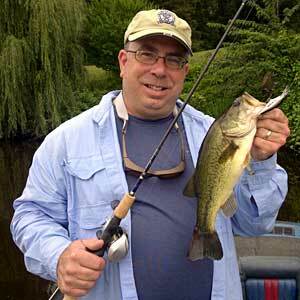 Mark cameraguy Gomez with his biggest largemouth bass of the day from the Grand River in Lansing. What the weather didn't know was both of us were so desperate to do some bass fishing it could only fail. As soon as it figured that out, the rain petered away. Actually, it may have been a blessing because the front broke that super heat we've had and the thick cloud cover got the real shallow bass thinking about food! If I'm getting out infrequently, I'm going to maximize the fun if I can get away with it! While cameraguy started with his ever present swim jig, I pulled out a Firetiger Pop'R. I started us on up-and-down flats with lots of shallow wood and a little weed cover. Within minutes, I had my first fun blowup! Over the next hour or so, I had 6 or 7 exciting strikes landing a mix of smallmouth and largemouth bass including a small keeper and another close one. Actually not bad for that part of the river. When the topwater bite finally slowed way down, we continued to work deep to shallow transition areas with a decent amount of bites here and there on crankbaits, Texas-rigged worms and a few other lures. We had a couple little hot stretches and I missed a river toad that hit my crankbait in some broken rock then rolling up to show what I could have had. Looked like a Wiper, I told cameraguy! It was a pretty fun day even though we only caught a few actual keepers. The funny part, the adventure I really wanted to share didn't happen until we actually had my trusty Ranger Boat back on the trailer. I was doing a final walk-around of my rig when I noticed something strange - a wad of duct tape shoved up under the driver side dash. Odd. I'm a definite fan of duct tape but I could figure no way that it would end up under the exposed edge of my dash? And since I had just finished racing the car traffic down along Moores River Drive for a good mile, you'd think it would have blown out?!? I casually reached up under the edge and grabbed the 'tape.' That's when the tape wiggled under my fingers! I have to admit, I jumped and may have made an unmanly noise. I did not expect the 'tape' to be quite so soft and squishy. And have beady little black eyes!! My first thought was bat which I'm sure is the cause for the unmanly noise. Then I saw the tail. Staring back at me from under the edge of my dash was not a bat, but a mouse! Picture this - that mouse had to be there all day or I would have seen it running across the deck. For hours, that little furry squirt was hiding, though exposed, inches from my hand! At the end, I'm running 55mph (the inland speed limit) down the Grand River. Can you imagine what had to be going through that mouse's little brain as its little ears flapped like Palm fronds in a hurricane?!? I had my prescription sunglasses on and couldn't see well enough to get hold of the little varmint's tail or paw with my needle nose pliers. It would not budge! Even when I got its paw once it was wedged in there so tight I lost my grip as it fought me with all its mouse-might! It if didn't wiggle in a little tighter and stare at me with those beady little eyes, I almost wouldn't think it was a living creature! You'd think it would have run out a long time before. Like maybe while I was driving the trailer down bumpy roads? Or maybe while running the boat up and down the river. Or possibly while two guys are standing there yakking for hours while whacking bass. We could have seen it at any time if we would have just looked at the right edge of the dash. Every time I switched the main graph on and off I was reaching within 5 or 6 inches of the little cheese-snapper! So I keep trying to grab it with the pliers - I feel like getting bit - rabies is nothing to mess with. I didn't really want to hurt the mouse even though I'm not real happy finding it in my boat. cameraguy is standing there laughing at me. He grabs the pliers, and even though he is a lot older than me, he reaches right in and grabs its tiny paw. You should have heard the squeaking then! The mouse, not me!